Donald Trump gestures to the gathered crowd of Boy Scouts. 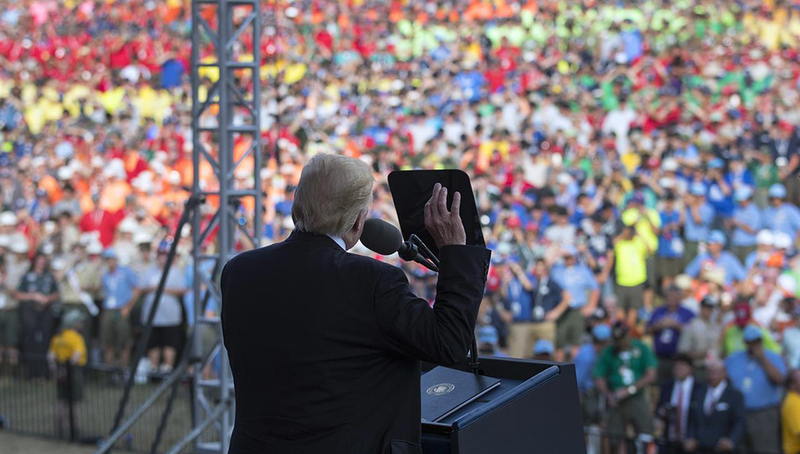 Trump’s outrageous and bizarre speech to 40,000 Boy Scouts at the BSA National Jamboree in West Virginia is being likened by some to a Hitler youth rally. Once again, Trump blew through every norm of decency and morality as he attempts daily to drag the country into uncharted territory, authoritarianism, and a constitutional crisis. The sitting president is the Scouts’ honorary president and is always extended the courtesy of addressing the Jamboree. But never has a president made a hate-filled speech to the Boy Scouts like this one: calling for loyalty, cursing, attacking the media, inciting the crowd to boo former president Barack Obama and Hillary Clinton, recounting his electoral victory, stoking opposition to Obamacare and wallowing in narcissism. The backlash has been swift and widespread. The BSA quickly and wisely separated itself from Trump’s speech, reiterating that it is a non-partisan organization. But the damage has been done. I wonder what impact Trump’s appearance had on the young scouts who attended. It reminded me of my own experience. I joined the Boy Scouts at the age of 10 or 11 years old. My father had been a scout and I couldn’t wait to join. There were two troops in the community I lived in at the time in Northeastern Ohio. I was enamored with the uniforms, merit badges, the matching equipment, learning to make knots and reading maps, identifying constellations and teamwork. I dreamed of attaining Eagle rank. Most of all, I enjoyed camping. I pored over the Scout Manual, learned to make fires with two matches, set up a campsite and cook. I loved the camaraderie, hikes, gathering around the nightly bond fires, and the storytelling. My only bad experience camping was in the dead of winter. The Boy Scouts ran Camp Manatoc Reservation in Peninsula, not far from where I lived, and our troop had a weekend outing. The ground was covered in a fresh blanket of snow and that night the temperature plummeted. Even though we slept on bunks in a cabin, I vividly remember feeling I would freeze to death. I had my father’s old worn sleeping bag and my feet never got warm. I was up all night rubbing my cold feet and was glad when the morning finally arrived. I immediately helped build a fire, warmed myself and drank some hot cocoa. I wanted to stay put by that fire all day. But two experiences really soured me on the Scouts. The first was a weeklong camp during the summer at Camp Manatoc Reservation. One of the tests we had to pass was treading water in Lake Okchanya. If you passed you could swim in the lake. If not you could only wade in the shallow end. During the test, all the scouts in my troop passed but me. I had to practice and take the test a second time. This time African American Scouts from another troop were among those being tested. I can still see my Scoutmaster glowering from the railing above me as I struggled to tread water. I found out later he was racist to the core and didn’t want me swimming with the black scouts. That really disturbed me coming from a family that fought racial segregation in my hometown and supported the civil rights movement. I detested that Scoutmaster. The final straw came during a region-wide weekend Jamboree near Akron. Hundreds of Scouts had gathered with their tents. On Saturday morning, the bugle sounded and we were all summoned to assemble in the main staging area. Off in the distance, we saw a helicopter approaching. The helicopter landed dramatically in the middle of the assembled Scouts. Out stepped four color guards, one representing each branch of the military service. We had to stand at attention while they stiffly marched past us to raise the flag. 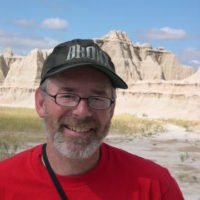 I’m sure there are lots of great Scouts and Scoutmasters in the BSA today who enjoy learning all the outdoor skills and teamwork and dream of earning Eagle rank. They must be mortified by Trump’s embarrassing and reprehensible appearance and the gross violations of a basic tenet scouting: always look out for one another.